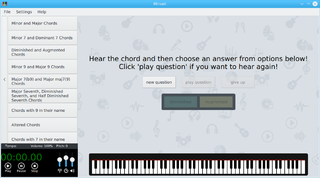 Minuet is a free and open source software for music education. Music education Free Software, thoughtfully designed to push your musical skills to the next level. Enhance your ability to recognize intervals, chords, rhythms, and scales while enjoying all the power of Free Software. A Lot Of Exercises: Nearly 40 exercises regarding intervals, chords, and scales. Visualize of Music: Check your musical perception skills on piano keyboard. Highly Configurable: Adjustable playing settings, from beginners to pro. Extensible: Create your own exercises and adapt Minuet to your needs. Cross-Platform: Minuet now works on GNU/Linux and Android. This page was last modified on 15 August 2017, at 08:05. Content is available under Creative Commons License SA 4.0 unless otherwise noted.